Sherlock Holmes, bagpipes, and some of the world’s finest whiskies all hail from Scotland—but the country’s cutest export might be the Scottish Fold Cat. (Sorry, Scottish Terriers.) Learn more about the floppy-eared feline, whose popularity has grown so much across the Pond that the Cat Fanciers’ Association (CFA) named it America’s 10th most beloved breed [PDF] in 2014. Apart from its large, wide-spaced eyes and round body, a Scottish Fold’s most distinguishing feature is its ears. They bend forward and “fold” closely over the cat’s head—a characteristic that often prompts people to compare the kitty’s appearance to an owl or a teddy bear. This trait is caused by an incomplete dominant gene that resulted from a spontaneous mutation. 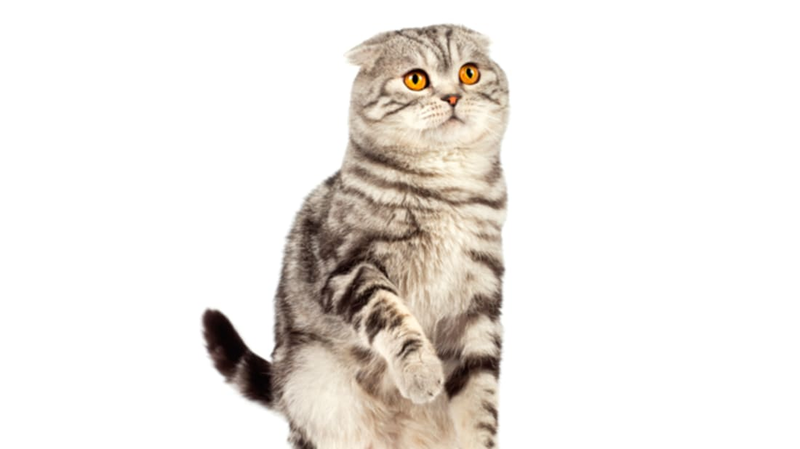 It affects the cartilage in the kitty’s body; while the Scottish Fold’s ears are the most visible sign of this abnormality, the rest of its body is also impacted. 2. ... THAT SOMETIMES CAUSES HEALTH PROBLEMS. Scottish Folds suffer from varying degrees of osteochondrodysplasia, a painful condition that's characterized by defective bone development and bone and cartilage abnormalities. In severe cases, it can lead to arthritis; fusing of the tail, ankles, and knees; lameness; misshapen limbs; and an abnormal posture and walk. To avoid potential deformities, breeders out-cross Scottish Folds with straight-eared cats, like British or American Shorthairs. 3. SCOTTISH FOLDS ARE BORN WITH STRAIGHT EARS. Scottish Folds are born with normal, pointy ears. They don’t develop their trademark look until they’re around 2 to 4 weeks old and the ears begin to fold. A cat's ears might also stay straight; these kitties are sometimes called Scottish Shorthairs. However, the CFA and other cat fanciers’ associations only allow cats with complete ear folds to compete in shows. The Scottish Folds’ ears once weren’t as dramatically creased as they are now. Their ears folded from about halfway up, tilting forward and down. Decades of selective breeding are responsible for the double or triple ear folds of modern Scottish Folds, which cause their ears to lie completely flat. 4. THE SCOTTISH FOLD BREED BEGAN WITH A BARN CAT NAMED SUSIE. In 1961, a white barn cat named Susie with quirky folded ears was found at a farm in Perthshire, Scotland. She later gave birth to two kittens that shared the same trait. William Ross, a local farmer and cat lover, adopted one of the unique kitties, and in 1966, he registered the new breed with Great Britain’s Governing Council of the Cat Fancy (GCCF). Ross and geneticist Pat Turner began breeding the Scottish Fold, and three years later they had produced 76 kittens, 42 with folded ears and 34 with straight ears. Over the years, the cats were cross-bred with British Shorthairs and other cats to produce the sweet, round-faced kitty we know and love. Today, all Scottish Fold cats can trace their lineage back to Susie. 5. SCOTTISH FOLDS ONCE HAD A DIFFERENT NAME. Since they look a bit like lop-eared rabbits, Scottish Folds were called “Lop-eared” or “Lops” until the breed was registered and its official name became the Scottish Fold. 6. SCOTTISH FOLDS COME IN MANY PATTERNS AND COLORS. You’ll find the short-haired, medium-sized Scottish Fold in every color and pattern, ranging from black, blue, and red to tabby and shaded silver [PDF] . (Cats with chocolate, lavender, or Seal Point coloring are disqualified by the CFA, as they indicate hybridization.) A Scottish Fold’s eyes can be any shade, although they’re typically copper. You’ll also occasionally see longhaired Scottish Folds, which some associations call the Highland Fold. The GCCF—the U.K.’s largest registration body for cats—originally accepted Scottish Folds for show in 1966. However, by 1971 the organization had stopped letting pet owners register the kitties because they were worried about physical deformities, ear mites and infection, and deafness. These concerns ended up being unfounded, but to this day the cat still isn’t shown in Europe. 8. ...BUT THEY'RE BELOVED IN AMERICA. In 1970, the Scottish Fold crossed the pond when three kittens were shipped to Neil Todd, a New England scientist who was investigating spontaneous genetic mutations in felines. Todd finished his research, and various parties and breeders adopted the Scottish Fold kittens born under his care. In 1977, Scottish Folds were given provisional status in the CFA; over the decades they've become a highly sought after kitty in America. Today, cat lovers who want to own a Scottish Fold might have to be put on a waiting list, and pay several hundred dollars for a kitten. 9. SCOTTISH FOLDS ARE KNOWN FOR THEIR WEIRD POSES. Scottish Folds are known for sitting, standing, or laying in a variety of cute—and comical—human-like positions. They'll sit on their haunches in a "Buddha" position; they'll stand on their hind legs; and they'll flop, stretch, and twist themselves into other unusual poses. 10. SCOTTISH FOLDS ARE POP CULTURE FIXTURES. If you haven't seen an Instagram video of Taylor Swift's two Scottish Folds, Olivia Benson and Meredith Grey, or scoped out famous Internet "purr-sonality" Maru's social media presence, you might want to read author Peter Gethers' book, The Cat Who Went to Paris (1990), and its sequel, A Cat Abroad (1993). Both works tell the touching story of Gethers and his favorite companion, a Scottish Fold named Norton. All photos courtesy of iStock.